Kerry has a myriad of fantastic cycling opportunities. 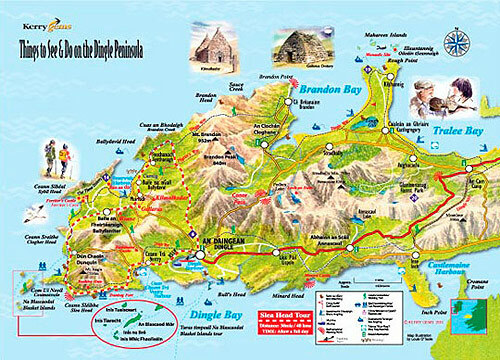 This is a classic cycle, taking in the some of the finest coastal scenery in Ireland. There are many stopping points for incredible scenery, history and archaeology. There are also a number of cafés along the route. The tour takes in Ventry, Slea Head, Dunquin and Ballyferriter, with short detours to Reask, Gallarus and Kilmalkedar, three of Ireland’s most important archaeological Early Christian sites. Distance: 42 km (26 mi) and should take about five hours. Bikes: Bring your own or hire locally. Cost of bike hire: About €15. Nature Interest: Choughs, red bill and legs. Very acrobatic in the air. Cág Cos Dearg. Cycling Killarney hires bicycles to the public on Muckross Road, close to the National Park. As motor cars are barred from the National Park, the trusty pedal cycle is ideal for viewing the mountains and lakes. A half-day tour takes you through the Knockreer Estate to Knockreer House & Gardens and along the lake shore to Ross Castle. Ross Island with its ancient copper mines is well worth a visit. Allow a full day for the Muckross/Dinis tour. This 14-mile (22km) circuit takes in Muckross Abbey, Muckross House & Gardens, Dinis Cottage, the Old Weir Bridge, the Meeting of the Waters and Torc Waterfall before returning to town. A great day’s adventure! 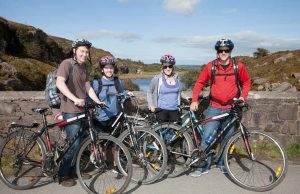 The more experienced rider will enjoy the 48km (30mi) odyssey through the epic Gap of Dunloe, the Black Valley and Moll’s Gap, returning to Killarney via Ladies View on the N71. Cycling Killarney is located at both the Flesk Caravan Park, Muckross Road (on the Kenmare side of the Gleneagle Hotel) and at Sugan Hostel, Killarney town centre. Contact David Sheahan at the number below for more information.